that they quickly wear out. I know, because I’m fed up too. and who knows how well the clothes will fit? Especially when you are ordering online. or someone close to her made them. impeccable fit and classic style. 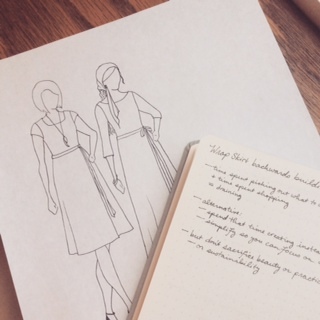 when hand-crafting wardrobes perfectly suited to themselves. This doesn’t have to be, though. and her great-grandmother before that. who knew how to make clothes with their hands. This is in your blood. All you have to do is awaken it. Perhaps you’ve never threaded a needle. No matter; thread one today and you can change that. a button that had fallen off, or a small tear. Well, then! You’re a step ahead! Take the next step and learn some more. Perhaps you have made things for yourself. you are ashamed to claim as your own creation. but to become an artisan. A maker with the skills to create works of art. and in a logical order. and even the oldest was not too old to learn new tricks of the trade. but to see yourself as you will be in the future: an artisan. then you are an artisan! to lead you to where you will be tomorrow. completely by herself (I had hardly touched it). but perhaps it would be hard to make that happen. So instead, you can bring a small part of me into yours. The skirt that Allison made is more than a simple skirt. but on the girl making it. an artist capable of making a work of art. This is the same goal I have for you. In this book I have included the instructions to make a skirt, yes. how to use this skirt to make yourself an artisan! similar to the instructions you would find in a typical sewing pattern. to use for your skirt. in order to create a skirt you will love. all using the same framework outlined in the book. then you will learn the skills you need to make this skirt!